Upon arrival in Lombok, our guide/representative will meet and welcome you at the Airport, then transfer by private AC coach to your hotel in Senggigi to check in. Dinner at a local restaurant in Senggigi/Mataram Area, free on your own leisure. In the morning after breakfast, meet your guide at your lobby hotel for start a Sendang Gile and Tiu Kelep Waterfall tour. This tour covers the whole of Lombok on northern part and presents you the experiences over the nature, culture and mankind civilization on this region through centuries. 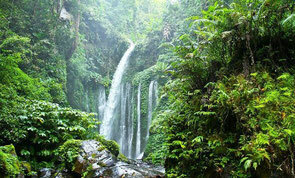 Sendang Gile Water Fall, located 600 meters above sea level on the foot of Rinjani Mountain. cool and quiet hill, gives you a comfortable rest. 300 meters down is the biggest waterfall in Lombok, irrigates the environment with its crystal clear water coming from the nature. After visiting Sendang Gile & Tiu kelep Waterfall, lunch at a local restaurant in Senaru village, after lunch transfer back to your Hotel. Your guide will inform timing to romantic dinner at your hotel, free on your own leisure. After breakfast, meet your guide at your lobby hotel and then you will be transferred to Teluk Nara harbor where you will catch the boat to explore the islands. This tour is specially designed to see all the three Gili Islands in one day. We combine panorama countryside with the famous of the Gili islands. A Full day tour full of sea activities, first you'll take to the Pusuk Pass, some of 403 meters above sea level. Here you can see wild monkeys play by road side. From here onto Teluk Nara harbor to get the boat start to explore the islands and snorkeling, first go to Gili Air for snorkeling, swim or just relax on the beach. Then enjoy huge coral reef area in Gili Meno where you can find as well blue coral on your next stop. Lunch served at pointed restaurant on the island. Your experience will be completed by a visit to Gili Trawangan, tranquil island for leisure and sun bathing on flat white sandy beach. At 3 pm leave the island and back to your hotel with a boat and drive through coast line, some stops on the way at Mipah and Malimbu hill a good spot for photograph. Dinner at a local restaurant in Senggigi. free on your own leisure. Before check out from your hotel, to complete your honeymoon, enjoy one hour SPA massage for two at the SPA facilities in the hotel area, then your guide and driver will escorted you to Lombok Airport to catch your flight. End of program.